Enjoy a breath of fresh air among stunning scenery and stay for a while in one of our gorgeous Mongolian yurts. Comfy beds, fresh linens, colourful rugs and cushions, and a cosy wood burner await you in our beautifully furnished authentic yurts. The views around this small and exclusive site are simply stunning; it really is a romantic idyll. After dark you can sit around a camp fire, toast marshmallows and gaze at the countless stars visible in the unpolluted night sky. You can easily idle a day away pottering around the stream with the kids. There is wildlife to watch out for, games to play, adventures to be had and relaxing to be done. There are plenty of walks in the area, if you are feeling like a stroll or a challenge, with maps and directions provided. You can cook on the stove top, but we also supply a gas hob and grill to make life easier in a little kitchen area in your yurt (this is glamping after all) as well as a table and chairs, pots and pans, cool box, plates, bowls and cutlery of course. Wall hangings and twinkly solar lights make the yurt a magical place to relax in as you get back to nature in a very comfortable fashion: the essence of glamping. Hot showers and toilets are located only a short walk from your yurt: right next to the honesty shop, which also has a plug in kettle, microwave, fridge freezer, WiFi, and plenty of books and games you are welcome to borrow. The Ettrick Valley is also a wonderful base for exploring the Scottish Borders with its rich cultural and historic heritage, and natural wonders such as the Grey Mare's Tail and St Mary's Loch. We also have a small honesty shop on site for any essentials you may have forgotten as well as a few little luxuries. You can easily idle a day away pottering around the stream with the kids. There is wildlife to watch out for, games to play, adventures to be had and relaxing to be done. There are plenty of walks in the area (for all levels) if you are feeling like a stroll or a challenge, with maps and directions provided. The area is a must for cyclists with miles of lovely (but not too challenging) scenery to cycle through - again with many maps and routes available. For those who like a cycling challenge, 7tanes mountain biking centre is on Forestry Commission land close by. Fishing, horse riding, and kayaking are all available in the area, or how about 4x4 driving, paragliding or a tree top adventure at Go Ape? Hot showers and proper toilets are a short stroll from your Yurt. We also have a small honesty shop on site for any essentials you may have forgotten as well as a few little luxuries. Cooking facilities include a gas burner and grill as well as a stove top in your Yurt, and your very own charcoal BBQ and fire pit outside. We look forward to welcoming to you to this special part of Scotland: come and escape to the Ettrick Valley. There are currently 5 yurts onsite (each sleeping up to 6) with single folding futons and larger king-sized beds. Bedding is provided, as are rugs and cushions. A Windy Smith wood burning stove provides heating and can be cooked on. There's also a gas burner and grill. plus a BBQ outside. Tables, chairs, pots, pans, crockery and cutlery are all provided. Though there are plenty of solar lights for the evening, the 5ft crown in the centre is perfect in the daytime and if you turn everything off at night you can enjoy the stars from inside. A short walk from the yurt are proper flushing loos and hot showers, along with a common room with table football, games, books, Wi-Fi and an electric kettle and fridge/freezer. There is ample space around each yurt for playing and a raised deck outside for sitting out and enjoying the views. 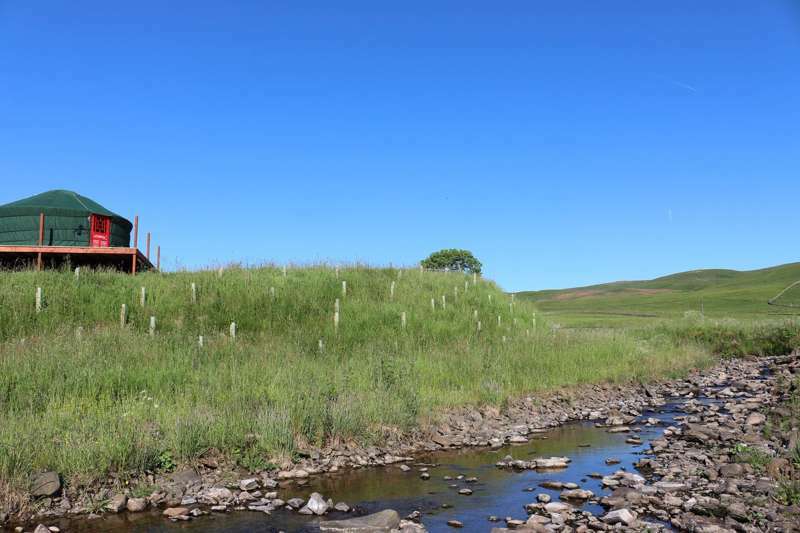 One of the yurts is also right next to the Newburgh Burn, brilliant for paddling around and having fun, and the second yurt is also extremely close by. The burn flows into the River Ettrick, which is securely fenced off but still easily accessed. Fishing permits are required (salmon and trout) which can be bought in Selkirk at Rogersons Newsagent or online at Fishtweed. Maps are provided for those wanting to take on the local walks or cycle routes, of which there are plenty. 5 yurts (6m diameter) set in the beautiful Ettrick Valley. Each yurt can sleep up to 6 people but, with beds and futons that can fold away, it is also available for couples looking for plenty of space. Glamping only so tents, campevans, caravans – no. Rain could be the chance for a city day trip. Head to Edinburgh, 70 minutes away. Walk or bike the hills close by including famous cycle routes used in the Tour o' the Borders road race. For off road biking, the internationally-renowned 7 Stanes courses (01387 702228) at Glentress and Innerleithen are a great day out where bikes can be hired. Those on the hunt for the best views and landscapes should look for routes around Grey Mare's Tail waterfall (08444 932249) and St Mary’s Loch. The Scottish Borders boast more than just a natural outdoor playground and there is culture and history aplenty: Country houses such as Bowhill (01750 22204), Abbotsford (01896 752043) and Traquair (01896 830323); castles such as Neidpath (01721 720333), Floors (01573 223333) and Thirlestane (01578 722430); the ruined abbeys of Melrose (01896 822562), and Kelso (01316 688600); and pretty Border towns like Peebles (01721 723159), Melrose, and Newton St Boswells to name just a few of the top spots. A small shop stocks any essentials, plus a few luxuries. If you don't fancy using the cooking facilities in your yurt then The Gordon Arms (01750 82261) and The Cross Keys Inn (01750 52224) are a 10 and 15 minutes' drive from the site (or a slightly longer cycle). Both welcoming and friendly, serving excellent food and drinks, sometimes with live music. From Edinburgh: From the A720 City Bypass, follow A68 south to the Newstead Roundabout then follow signs to Galashiels and Selkirk. From Selkirk take the B7009. We are about 6.5 miles past Ettrick Bridge on the left. From Edinburgh Airport/Glasgow: Travelling east, turn off the Edinburgh bypass at the Straiton Junction and take A701 to Peebles. Then take the A72 to Innerleithen and then the B709 past Traquair to Tushielaw. Turn left here, Ettrick Valley Yurts is about 2.5 miles on the right. From England: From the A1 take the A68 north of Darlington. Turn off at Newstead Roundabout and follow signs to Galashiels and Selkirk as above. Or from the M6 take the A7 to Hawick and then Selkirk.